I took on the project of staining our back deck this weekend and I knew that I would have little time to make a good lunch. I found this great recipe on Pinterest which lead me to the website gimmesomeoven.com. I pre-made my quinoa the day before so that it would be nice and cold. 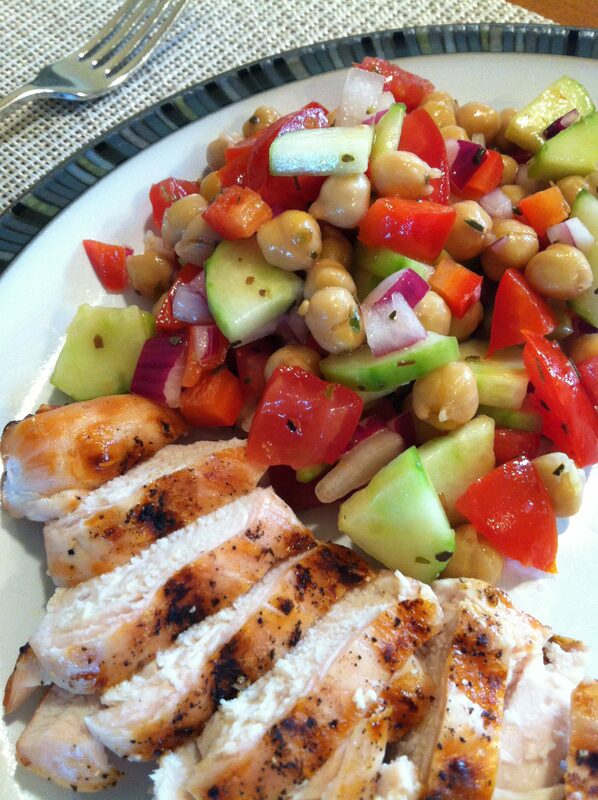 This salad is super fresh and delicious! It is easy to make and it doesn’t take long to put together. It was the perfect salad to have while working outside on a hot day. I crumbled the feta on top of my serving and did not add it into the salad. I also only used half of the dressing. I will definitely use the other half on a garden salad. 1. Toss all ingredients together until combined. Serve immediately. 1. Whisk all ingredients together in a small bowl until combined. *If you add hot quinoa fresh out of the pan, it will melt the cheese and wilt the basil in this recipe. It is recommended to cook the quinoa beforehand and chill. This recipe is easy and full of flavour. I found this recipe on Pinterest which lead me to the website eat-yourself-skinny.com. I only had yellow and orange peppers in my fridge, which was fine, but for my picture I wish I had a red pepper. I used 3 chicken breasts that I pounded down and I added 6 strips of pepper into each breast. I also marinated my chicken for about 3 hours. 1. In a small bowl, whisk together olive oil, lime juice, garlic, chili powder, cumin, oregano, salt, cayenne (if using) and cilantro. Set aside. 2. For the chicken breasts, if you purchased pre-sliced chicken cutlets en skip to the next step. If using chicken breasts, slice them longways into 2 even slices and firmly pound the chicken using the smooth side of the meat tenderizer to an even thickness of about 1/4 inch. 3. Place chicken cutlets into a large freezer bag and pour marinade over top, making sure they are completely coated. Allow chicken to marinate for a minimum of one hour to overnight. 4. Once chicken has marinated, evenly place 6 bell pepper slices in the middle of the chicken cutlet, roll up and secure with a toothpick. Repeat this step until all the cutlets have been rolled up and place seam side down in a prepared baking dish. 5. Brush tops of the chicken with remaining marinade and bake, uncovered, at 375 for about 25 to 30 minutes or until the juices run clear. Serve and enjoy! This recipe is a definite “winner winner chicken dinner”! My husband called it the best chicken recipe ever. The mustard glaze is sooooo good and the chicken coating is crispy and super tasty. I used 4 chicken breasts and not thighs with great results. I would also use this recipe for making chicken fingers. I found this recipe on damndelicious.net. 1. Preheat oven to 375 degrees F. Line a baking sheet with parchment paper or a silicone baking mat; set aside. 2. To make honey mustard glaze, whisk together mayonnaise, honey and mustards in a small bowl; set aside. 3. Season chicken thighs with salt and pepper, to taste. 4. In a large bowl, whisk together eggs and milk. In another bowl, combine Panko, paprika and vegetable oil; season with salt and pepper, to taste. 5. Working one at a time, dredge chicken in the flour, dip into the egg mixture, then dredge in the Panko mixture, pressing to coat. 6. Place chicken onto the prepared baking sheet and bake for 35-40 minutes, or until the crust is golden brown and the chicken is completely cooked through. 7. Serve immediately with honey mustard glaze, garnished with parsley, if desired. This recipe is so fresh and full of flavour. It is so easy to make too! I found this recipe on Pinterest. It lead me to thegardengrazer.com. I served my salad with chicken for dinner. I made extra chicken to serve it again as leftover lunch. 1. Make the dressing in a small bowl, combine all ingredients and whisk to combine. Set aside. 5. Can eat immediately or refrigerate for at least an hour to let flavours combine. Some dressing will settle on the bottom, so stir before serving. My son couldn’t get enough of these chicken bites. We are big pretzel lovers in this house, so combining chicken and pretzels are a sure bet! I found this recipe on Pinterest which linked me to sallysbakingaddiction.com . This recipe is super easy to make. I used 3 chicken breasts and I also crushed 3 cups of Rold Gold Pretzel sticks. I also did not spray my chicken with the nonstick spray as my pretzels stayed on my chicken just fine. I lined a baking sheet with tin foil with excellent results. Leftover bites are great chopped up and added to a salad. !. Preheat oven to 400F (204C). Line a large baking sheet with silicone baking mat or coat heavily with nonstick spray. 3. Combine flour, salt and pepper in a shallow dish. Beat eggs in another shallow dish. Pour pretzels into a third shallow dish. Coat each chicken piece in flour, shaking off excess. Then, dip in egg and let any excess drip off. Then generously roll in the pretzels, shaking off excess. Add more crushed pretzels to the dish if you are running low. Place the chicken bites on the prepared baking sheet. Lightly spray each with nonstick spray to “seal” the breading, which will prevent the breading from staying raw and allows it to bake onto the chicken. 4. Bake for 8 minutes. Turn each piece over and continue to bake until the outside is crisp and the centers are cooked through, about 6-8 minutes more. Baking times may vary, just make sure yours are cooked through. If you like them more brown, cook longer. Serve chicken bites with toothpicks (if using as an appetizer) and honey mustard. Store any leftovers in the refrigerator for up to 2 days. 5. 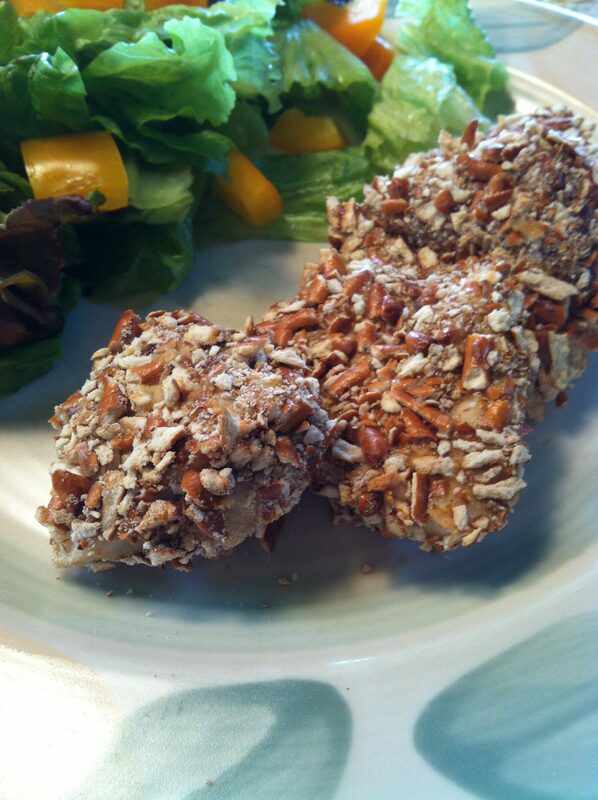 Make ahead tip: Baked chicken bites freeze well up to 2-3 months. Bake frozen chicken bites in a 350F oven for 20 minutes or until warmed through.